Multiple graded stakes winner Girvin put in his final official breeze this morning as he prepares for his next start in the 50th renewal of the Grade 1, $1 million betfair.com Haskell Invitational on July 30 at Monmouth Park. The 3-year-old colt by Tale of Ekati went to the track at Saratoga this morning and went five furlongs in 1:01 1/5 over the fast going. Owned by Brad Grady, Girvin sat near the front end along the backstretch, taking the lead in the top of the stretch, before just missing by a nose behind fellow multiple graded stakes winner Irap in his last start, the Grade 3 Ohio Derby at Thistledown on June 24. On his road to a start in the Kentucky Derby, the son of the Malibu Moon mare Catch the Moon won the two main preps at the Fair Grounds, the Grade 2 Risen Star and the Grade 2 Louisiana Derby, both in late-running fashion. Girvin will look to take home the Haskell trophy against some of the top 3-year-olds in the country in the mile and an eighth event. New Jersey-bred Irish War Cry leads the charge after finishing second in the Belmont Stakes. He won the Grade 2 Holy Bull at Gulfstream Park in February and the Grade 2 Wood Memorial at Aqueduct in April. 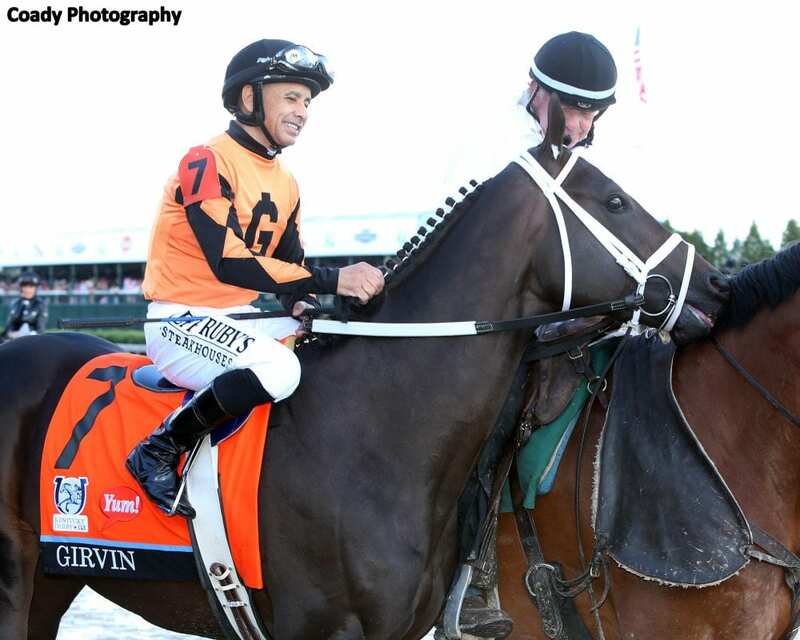 Other horses looking for a key Grade 1 victory in the three-year-old division include Affirmed winner and Kentucky Derby third place runner Battle of Midway; Chad Brown's duo of undefeated Timeline and multiple Grade 1 winner Practical Joke; Matt Winn champion McCraken; and, Iowa Derby victory Hence. The Haskell Invitational will air live on NBC from 5 to 6 p.m. Admission that day is $8 Grandstand ($4 seniors) and $10 Clubhouse ($5 seniors). Select reserved seats remain and can be purchased by contacting 732-571-5563. All paid admissions will receive the commemorative Haskell hat, while supplies last. The betfair.com Haskell Invitational is a Breeders' Cup Win & You're In event, which covers the $150,000 fee to race in the $6 million Breeders' Cup Classic at Del Mar on Nov. 4. This entry was posted in Breeders' Cup and tagged battle of midway, brad grady, Breeders' Cup, breeders' cup classic, girvin, haskell, haskell invitational, hence, irap, irish war cry, Joe Sharp, Louisiana Derby, malibu moon, mccraken, monmouth park, Ohio Derby, practical joke, Risen Star Stakes, saratoga, Tale of Ekati, timeline, win and you're in by Press Release. Bookmark the permalink.